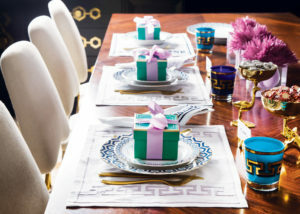 The holidays can be fraught, your table setting doesn’t have to be. Thanksgiving is just a few days away. 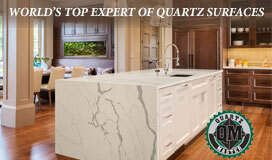 Here at Design NJ, we are all about gratitude, but we do realize that this holiday can be, shall we say, challenging. You may be up to your elbows in turkey while simultaneously strategizing your Black Friday sale schedule, along with performing complex algorithms in your head to ensure that your quarrelsome cousin sits nowhere near your outspoken uncle. The table setting though, that’s the easy part. It can be festive, fun, formal, friendly—whatever you want it to be. 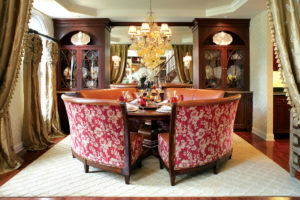 Here are some ways to set the tone you want for your Thanksgiving gathering. A rustic centerpiece surrounded by taupe and white china with minimal linens makes for a no-fuss feast. Plain white placemats topped by gold-and-silver-rimmed plates are accompanied by straightforward yet stunning crystal glasses. 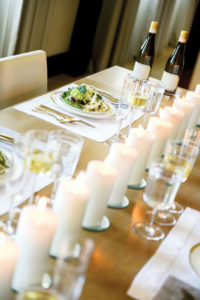 A row of white candles down the center of the table adds to the sophisticated look. 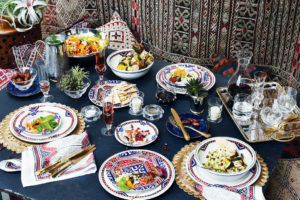 This Moroccan-themed dinnerware is bright, cheerful and a sure conversation starter. Black and white puts a posh spin on any occasion. 6. Create drama of the non-familial sort. Add some pops of bright color to your tablescape. Don’t be afraid to think outside the box. 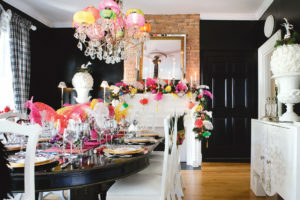 Here bright lanterns and feathers in non-traditional colors enliven the room.